It’s ridiculously easy to take a bad photograph. Your brain is a far better Photoshop than Photoshop, and the amount of editing it does on the scenes your eyes capture often results in marked and disappointing differences between what you saw and what you shot. Taking your brain out of the photography loop is the goal of [Peter Buczkowski]’s “prosthetic photographer.” The idea is to use a neural network to constantly analyze a scene until maximal aesthetic value is achieved, at which point the user unconsciously takes the photograph. Meanwhile, back in reality, it’s not too strange a project. A Raspberry Pi watches the scene through a Pi Cam and uses a TensorFlow neural net trained against a set of high-quality photos to determine when to trip the shutter. The video below shows it in action, and [Peter]’s blog has some of the photos taken with it. We’re not sure this is exactly the next “must have” camera accessory, and it probably won’t help with snapshots and selfies, but it’s an interesting take on the human-device interface. And if you’re thinking about the possibilities of a neural net inside your camera to prompt you when to take a picture, you might want to check out our primer on TensorFlow to get started. While most of the work inspired by the [Gates] foundation is work investigating a change in the geometry of the condom, [Firaz Peer] and [Andrew Quitmeyer] of Georgia Tech managed to solve this problem with an Arduino. The basic idea of the Electric Eel – yes, that’s the name – is to deliver short electric impulses, “along the underside of the shaft for increased stimulation”. These impulses are delivered in response to different sensor inputs – in the video example (surprisingly safe for work) they’re using a force resistor wrapped around the chest for an electrical stimulation with every breath. Although this is only a prototype, the hope is the conductors in the condom can eventually be implanted along the inside surface of a condom during manufacturing. We’re not quite sure what’s going on with our fellow hackers lately, but they all seem quite interested in finding inventive ways to scramble their brains. [Ben Krasnow] has put together a pair of videos detailing his experiments in transcranial magnetic stimulation, a process that looks like it would go quite nicely with the Brainwave Disruptor we showed you just yesterday. 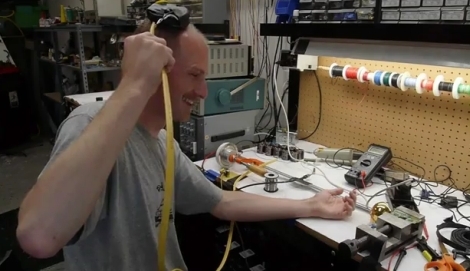 Instead of building a coil gun with a set of supercapacitors he had on hand, [Ben] decided to build a magnetic coil that can be used to stimulate his brain through his skull. Once his capacitor bank is charged, a high current pulse is sent through the coil held against his head. This pulse generates a strong magnetic field in the coil, which in turn produces neuron stimulation in his primary motor cortex. Be sure to watch both videos embedded below, as the first one mostly covers the theory behind his experiments, while the second video gives us the goods. [Ben’s] day job involves working with professional grade TMS devices, so he has some experience with this technology. Before you try this on your own, be sure that you are doing this safely, because a misdirected pulse of 1700 volts to the head does not sound like a fun time at all.